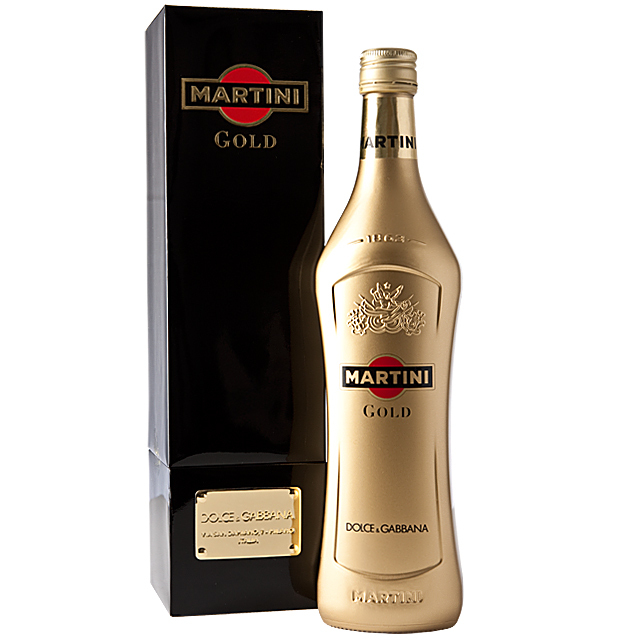 If you've wandered into an airport duty-free shop in the last year, you might have seen a bright gold bottle with logos of the spirits maker Martini and the designers Dolce & Gabbana. I'll bet that few if any Americans bought one of these (for about $25) and tried it: we don't drink a lot of straight vermouth here, and fans of Dolce & Gabbana would keep it unopened for the bottle. But you know what? It's fantastic. The marketing is all about the style. I found this breathless fashion site that has a frame-by-frame reconstruction of the TV ad that reminds me of the way film students study the shower scene in "Psycho." But I didn't find anyone taking it seriously as a drink, which is a shame, because the limited partnership for this stuff is over. Martini's not making it anymore, but you can still find the remaining stock in duty-free shops. The shelf life of unopened vermouth is pretty long -- 2-3 years at least -- so it's still going to be tasty. This is really a perfect summer drink. It takes Martini's dry vermouth formula and adds ginger -- a lot of ginger -- along with cubeb berries (whatever those are), bergamot and saffron. Served on the rocks, it's light, spicy and refreshing, with ginger dominant; the many botanicals that are a Martini corporate secret add complexity that's there if you look for it. It's 18% alcohol, and you can serve it with club soda if you want, but I liked it a lot just on the rocks. The owner of the bottle had to pry it out of my hands. But now I have one of my own. Sweet! The main thing to remember about vermouth is that, while it's fortified, it's still wine. The bottle needs to be stored in the refrigerator and, once opened, drunk within 4-6 weeks. You could probably add this to gin to make a very gingery martini. And I'm sure if I donated my bottle to one of the many creative cocktail bars within stumbling distance of my home in San Francisco, they could find lots of great uses for it. Yep, all I'd have to do would be give up my one bottle of this delicious, refreshing, limited-edition quaff that they're not making anymore, and new and interesting cocktails would be born. Up next: pigs fly in the Mission. Years and years ago - close to 30 as I was at the beginning of my career I bought a bunch of really nice Champagnes. On a lark I added a bottle of a Martini Asti reserve of some sort. I recall that it was about a third of the price of the least expensive French froth. When we drank them all later that night the Asti was by far the preferred wine. When Martini puts its mind to it they make some nice juice!